SANTA CLARA, Calif., Aug. 21, 2017 /PRNewswire/ -- Silego Technology today announced shipping three billion units since its introduction of the pioneering Configurable Mixed-signal ICs (CMICs). 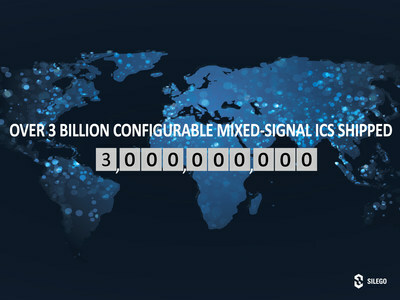 In addition, Silego announced it shipped more than one hundred million units in the month of July. Silego created not only the world's first family of Configurable Mixed-signal ICs but also enabled a paradigm shift for designers. Reaching these dual milestones are further validation of the Configurable Mixed-signal IC category and how enthusiastically customers have embraced this novel approach to Mixed-signal design for volume applications. John Teegen, Silego's CEO, remarked, "Reaching these milestones was made possible by the innovative Silego team and our dedicated manufacturing and channel partners. It also demonstrates the trust our customers have put in Silego's world-class operations team to get them to market quickly with quality and volume." Mike Noonen, Silego's VP of WW Sales and Business Development added, "Over the past year, we have grown our business with existing customers and introduced CMICs to many new customers. These customers have discovered Silego's clever combination of analog, digital, Non-Volatile Memory and software tools and are benefiting from a better way to design, prototype and go to production." Silego's CMICs use Non-Volatile Memory to configure each device and integrate analog, digital logic, and power functions, which allows design engineers to eliminate traditional standard linear, passive and discrete components from their system. CMICs enable original equipment manufacturers, or OEMs, in high-volume applications to cost-effectively deliver their products to market faster and with greater design flexibility. Recently Silego announced the new SLG46580, further expanding the GreenPAK™ (GPAK) family of Configurable Mixed-signal Integrated Circuits (CMICs). This newest GPAK is targeted to support power systems in wearable and handheld market segments. This device is both highly integrated and highly flexible, and can provide a rich set of features, including voltage monitoring, power sequencing, reset functions and low drop-out regulators (LDOs), that are configurable in settings and interconnect. This device is the second in the series of parts designed to create "Flexible Power Islands" (FPI).